Starting to see the benefit of posting about my pieces of Artwork. 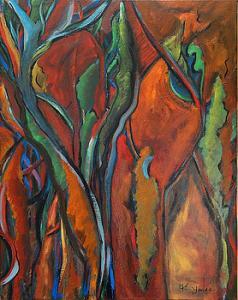 This piece, Orange-abstract, is a relatively new oil painting. My inspiration for the pairing is an internal struggle between technology and environment. It is great to be "plugged-in" but; do we not miss the connection with the environment and the people around us if we are constantly looking at that small screen? Seems to me there is a bigger picture to view. Lift your head a few degrees and see the wonders in front of you.